What are the large and small acts of resistance that have brought us to today? How can librarians and archivists help people make more meaningful connections between past and present acts of resistance? What previously untold stories of resistance should be preserved, shared, and told? Who is important to Philadelphia’s resistance history? Who is creating a history of resistance right now? How will future generations know about them? To begin answering these questions, we’ve held a series of community listening sessions. 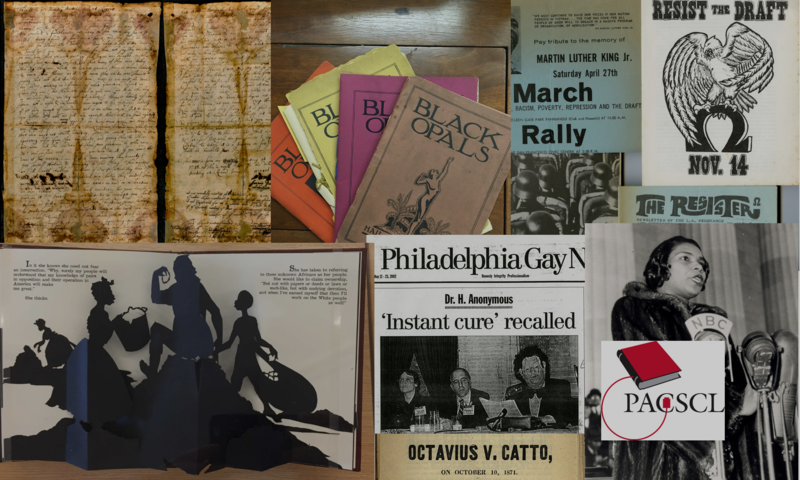 At these events, our project director and an archivist have facilitated discussions between activists, archivists, and the general public about resistance, archives, and their existing and possible impact on one another. A portion of the listening sessions also have consisted of audience members sharing their own experiences (positive or otherwise) with institutional archives and asking questions about the process of preserving their papers. All listening sessions are FREE and open to the public. If you’re interested in having us host a listening session for your organization, please fill out our contact form and send us a message. Our closing event and final listening session is Tuesday, May 7, 2019! 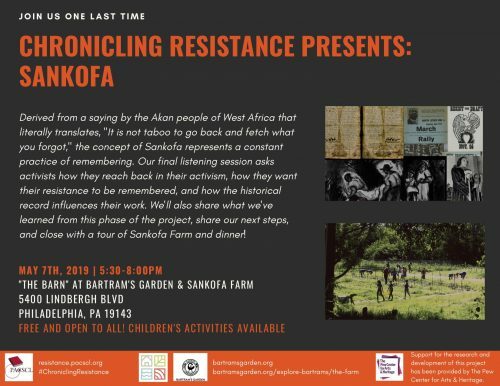 The theme for our final event is “Sankofa.” Derived from a saying by the Akan people of West Africa that literally translates, “It is not taboo to go back and fetch what you forgot,” the concept of Sankofa represents a constant practice of remembering. Our final listening session asks activists how they reach back in their activism, how they want their resistance to be remembered, and how the historical record influences their work. We’ll also share what we’ve learned from this phase of the project, share our next steps, and close with a tour of Sankofa Farm and dinner! Plenty of parking. Children’s activities available. We were unable to host the listening session with One Book One Philadelphia on Wednesday, March 6, 2018 at Free Library of Philadelphia, Lucien Blackwell Branch. The rest of the program continued as planned. Friday, Feb. 8, 7:00 pm, was canceled due to technical difficulties with the screening.